The situation in the combat zone remained tense yesterday. Russia-backed militants violated the ceasefire 30 times using mortars and heavy artillery alongside other types of weapons. Ukrainian troops returned fire 18 times. “Luhansk sector was the hottest spot where the enemy attacked Ukrainian strongholds 16 times using Minsk-proscribed weapons in six cases,” reported Ukrainian Ministry of Defense spokesman on ATO Oleksandr Motuzyanyk at a press briefing at Ukraine Crisis Media Center. 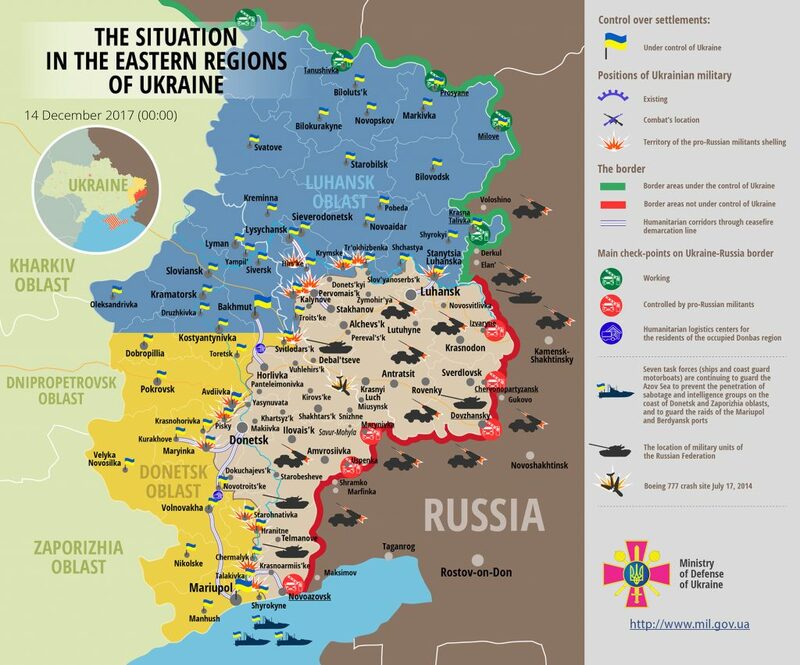 The majority of the hostile attacks in Luhansk sector took place between midnight and 07:00. At about 04:00 Russia-backed militants started an hour-long shelling of Ukrainian positions with 152-mm artillery. Moreover, Russian proxies used 120-mm mortars six times in Luhanske, Popasna, and Kriakivka areas having discharged a total of 58 rounds. Militants also fired forty-two 82-mm mortar rounds near Luhanske, Novooleksandrivka, and Popasna. Russia-backed militants also used grenade launchers, heavy machine guns, and small arms in Zolote, Krymske, Lozove, Luhanske, and Popasna. Ukrainian troops returned fire seven times using grenade launchers, small arms, and IFV mounted weapons. In Donetsk sector, Russian proxies violated the ceasefire 14 times. “In the majority of the incidents, the enemy used small arms and grenade launchers only, except for Vodiane where they shelled Ukrainian troops’ positions with 120-mm mortars. Moreover, they used 82-mm mortars in Avdiivka and Maryinka areas. “The enemy also attacked Ukrainian strongholds near Avdiivka, Hranitne, and Kamianka with small arms and grenade launchers,” Colonel Motuzyanyk said. Militants used grenade launchers and small arms near Maryinka, Vodiane, Pisky and Shakhta Butovka as well. Ukrainian troops returned fire in the majority of the incidents using weapons not proscribed under the Minsk agreements. Unfortunately, one Ukrainian serviceman was killed in action outside Avdiivka as a result of a hostile small arms attack, and another was wounded during a hostile attack near Luhanske. Report on the military developments as of December 13 is available here. Interactive data on the shelling: chronology shelling chart and the interactive map.